Because warehouses are perhaps the least glamorous type of building in a facility executive’s inventory, they often represent missed opportunities for implementing energy efficiency strategies. Even though the cost savings can be significant. The two biggest energy consumers in a warehouse are lighting and temperature control (in the form of heating, cooling or refrigeration) and account for approximately 76 percent of total energy use making these systems the best targets for energy savings. Here we offer some tips on how to save yourself energy while also reducing your warehouse carbon footprint. Every bill payer /business owner will tell you that the bills paid towards electricity in warehouses can be exhorbitant; but every warehouse could be made more energy efficient by taking some simple steps. With some simple steps, you can not only save yourself money, but can also make your warehouse more carbon neutral and reduce your carbon footprint. In this post we discuss four ways to reduce warehouse energy costs and your carbon footprint. One question energy-conscious facility executives should consider is whether to use high-intensity discharge (HID) fixtures or fluorescent high-bay fixtures. Many of the latter type of products on the market now cater to industrial applications. Upfront, this isn’t always the least expensive option, but you will gain the savings back over time. By adopting more efficient lighting systems, most warehouses can save as much as 50% on their energy bill. Fluorescent fixtures turn on immediately, eliminating the warm up time of HID lighting. This long warm-up cycle often is the reason for leaving the HID lamps on even when the light isn’t needed. The downside to fluorescent lamps is that light output might be less than some HID systems, such as metal halide, and historically, fluorescent products have a shorter life than HID lamps. With recent advances in fluorescent technology, however, the gap is closing. Dimmers and motion sensors improve lighting efficiency on both types of systems. There are systems for area-wide dimming. These systems have matured in the last few years. It’s a handy way to quickly and cheaply reduce light output, without having to touch the fixture. They allow you to keep the light on, but reduce output. It involves attaching a panel, which is much cheaper to install. For fluorescent systems, a combination of dimmers and motion sensors can be used to create a low blanket of light over an area that then brightens where people are working. Motion sensors also extend lamp life. One way to improve light levels while reducing energy expenses is simply by keeping the fixtures clean. Painting walls white and installing windows and skylights to introduce natural light help too. 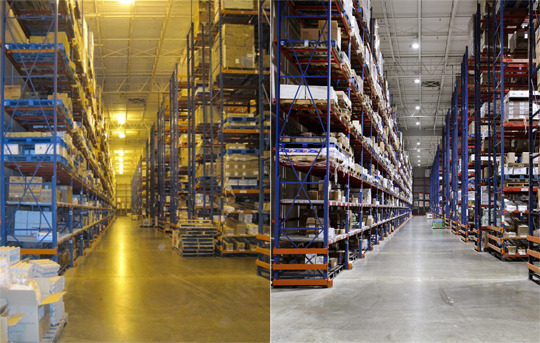 And more on the final lighting consideration for all warehouses: the use of daylight. Skylights are becoming commonplace because of exhaust requirements, but the light they bring in is an extra benefit. Thermal glass in the skylights can help maintain climate control too. Glazed skylights on north and south facing walls can help provide the optimal diffused daylight needed for a well illuminated warehouse. Diffused daylight is a better light source than lighting as it doesn’t cast the same shadows that overhead lights do and it reaches more of the warehouse. Daylight in the workplace is also associated with higher worker production and morale. By matching a photo-control system to well designed skylights you can have auto adjusting lights to keep the warehouse illuminated as the daylight fades while saving money during the day. Savings can come from new technologies, redesigned lighting, more efficient use of your current equipment and even small changes that add up to big savings. If you can reduce your energy use during certain periods of high energy use, some energy companies will provide a reduced rate and therefore your savings throughout the year will be fairly significant. To find out 20 common energy loss problems, which can easily be resolved with minimal cost investment, download our guide here. Next to lighting, a warehouse roof can be one of the biggest sources of energy inefficiency, experts say. Warehouse roofs are notorious for soaking up solar heat. While a facility’s ability to absorb heat might be advantageous for some facilities in the winter, it often means wasted money overall. Depending on the warehouse’s purpose, cool roof technologies could cut down on energy costs. Cool roof systems have two critical properties: a high solar reflectance, which means they absorb less energy from the sun, and a high thermal emittance, which means they radiate a large percentage of the energy they do absorb back to the sky. Regardless of climate, cool roof technologies are highly beneficial for warehouses with refrigeration storage. These facilities demand consistent year-round cooling regardless of location. Cool roofing technologies can improve energy efficiency in these facilities by 5 to 10 percent. Dry storage warehouses typically don’t have refrigeration year round, but still require a consistent temperature. In these settings, cool roofing systems can contribute an even higher percentage of cost savings. In buildings with no air conditioning, cool roof systems make the building more comfortable for workers. Since refrigeration and air conditioning are heavy strains on the power grid, cool roofing technologies can reduce peak demands and improve the load on the utility grid. While cool roof technology can reduce energy consumption in the summer, it also can increase energy consumption in the winter. In the winter there is value in heat gathering - you need to model the behavior of the building in all climates. When considering a roof change, you need to look at the overall impact. Depending on where you are, you might lose energy more by getting rid of heat. In calculating the energy savings from reduced cooling load and the energy penalty from reduced winter heat gain, it’s important to take into account rising costs of both heating fuel and electricity. While cool roofing technologies can reduce cooling costs, not all products are created equal. Energy Star roofing and coating products are good reflectors of solar heat, but not all coatings are compatible with all existing roof types. When selecting a cool roof, make sure the installer is experienced with the product selected. 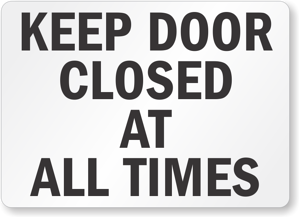 Where a door must remain open consider an air curtain, this will create a barrier of air that keeps the temperature stable even while the door is open. Air curtains can effectively reduce up to 80% of energy loss through a doorway. This means the savings made from the added insulation quickly pays for the initial expense. They are also effective at defending against airborne pests. 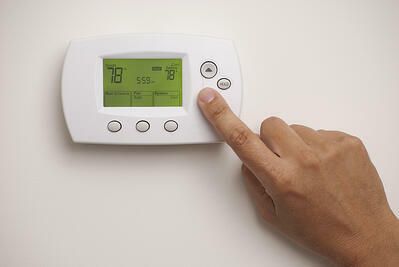 Constant thermostat adjustment can increase energy costs as well. A thermostat set to 55 degrees rather than 75 does not cool the room faster. If someone leaves the office and forgets to readjust the thermostat, the air conditioner is left running all night. Programmable thermostats can help with this. First, set a moderate temperature for occupied hours. In general, for each 1-degree increase in the thermostat setpoint, you can save 1 to 3% on cooling energy use. Program the thermostat to raise the temperature 5 to 10 degrees when you're gone. If your building uses multiple air conditioning units, each with its own programmable thermostat, set them so that the start times are staggered. This prevents all of the units from starting at once and creating a peak demand for electricity. Other measures like adding insulation; providing adequate ventilation; using light-colored or reflective roofing; reducing internal heat gain from lights and equipment; and using plants and awnings for shade can also reduce your cooling load, saving energy and money while improving comfort. Choosing building materials that are manufactured nearby will reduce your carbon footprint as the materials travel less distance. Using recycled steel and wood can reduce cost and makes your building more carbon neutral. If you cannot use recycled materials in the main structure think about them for your cafeteria space or other personal facilities.